The NEBOSH International General Certificate (IGC) in Occupational Health and Safety qualification is recognized worldwide. Green World Group(GWG) which was emerged in 2005, is a Middle East based company providing Health, Safety training courses in UAE, Nigeria, Angola, India (NewDelhi, Mumbai, Kolkata, Chennai, Hyderabad, Cochin, Ahmedabad, Pondicherry, Banglore, Chandigarh, Patna)with well experienced HSE experts. They have experience and a proven-track record in delivering practical and relevant solutions that cater to the global audience. Is the NEBOSH IGC Course Right for Me? • People who need a broad knowledge of Health and Safety issues. 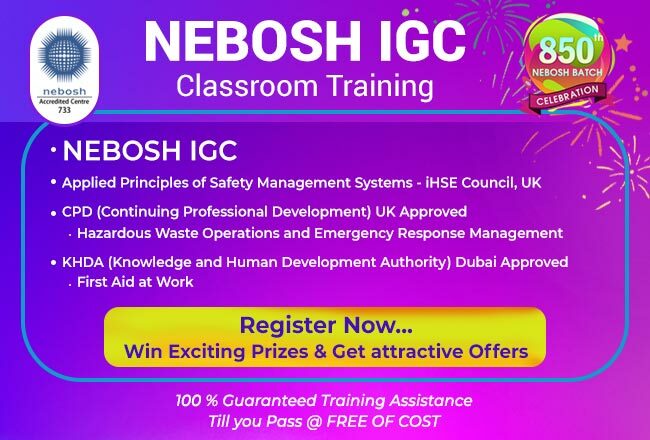 What Will I Learn from the NEBOSH IGC course? A NEBOSH (IGC) Certificate in OH&S will be given to the candidates who has completed the examinations and practical assessment successfully. Successful completion of the course also means you can apply for Technical Membership of IOSH (Tech IOSH) and for the Associate Membership of the International Institute of Risk and Safety Management, which gives the chance of adding AIIRSM after your name. Currently GWG offer for Nebosh training in Cochin at 33,999/-* INR and get 1 Year National Diploma.